With the latest Bond adventure, SPECTRE, due to hit our screens this October, it’s worth remembering that so much of what makes Bond great comes down to the dedicated stunt performers who allow 007 to do the impossible and to save the day. Roy Taylor is one of those stunt performers, whose credits include SPECTRE, Avengers: Age of Ultron, The Dark Knight Rises, and The Bourne Ultimatum, to name but a few. However, Roy is stepping into producing and directing shoes for his next film, “The Man Who Flew To Earth”. The film documents fellow stunt performer Gary Connery’s ambitious stunt to leap from a helicopter and land without a parachute. The film is dedicated to the memory of Mark Sutton, who doubled for James Bond during the Opening Ceremony of the 2012 Olympics in London when he parachuted from a helicopter into the stadium. Sadly, Mark lost his life in an accident in the Chamonix Mountains last year. 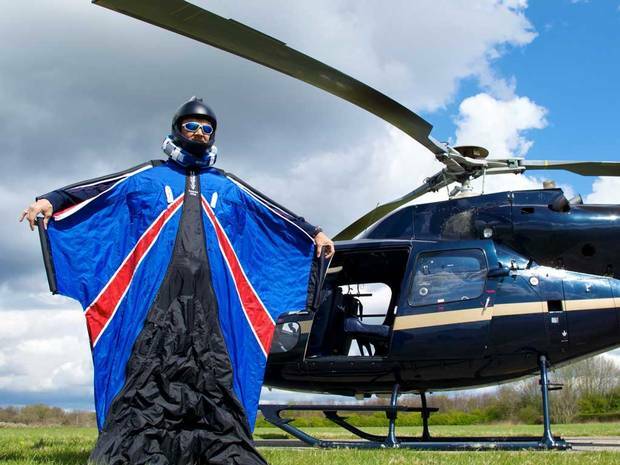 His death was regarded as a major loss to the community of wingsuit flying, among whom he was considered to be one of the world’s best. The film is in the can, but the post production costs are being crowdfunded via Kickstarter, with some rather fun rewards on offer – one of which is a track day with former Stig, Ben Collins, who has doubled Bond on a number of driving sequences. Additionally, there is the opportunity to have dinner at BAFTA with stunt doubles who have worked on the Bond films. There’s only a few days left to help fund this film, so if you are interested in making a pledge, now is the time! Check out the details of the Kickstarter rewards here.